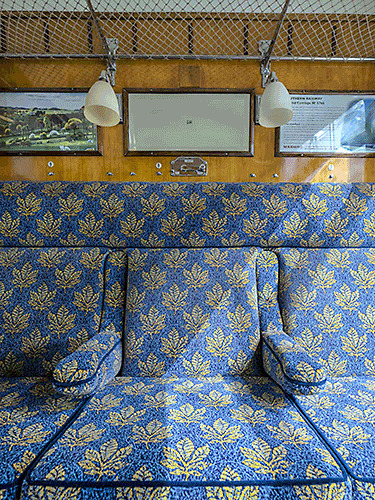 The relaunch of SR Bulleid Composite Carriage No.5768 will take place 15th - 17th March - The Bluebell Railway's Branch Line Weekend. 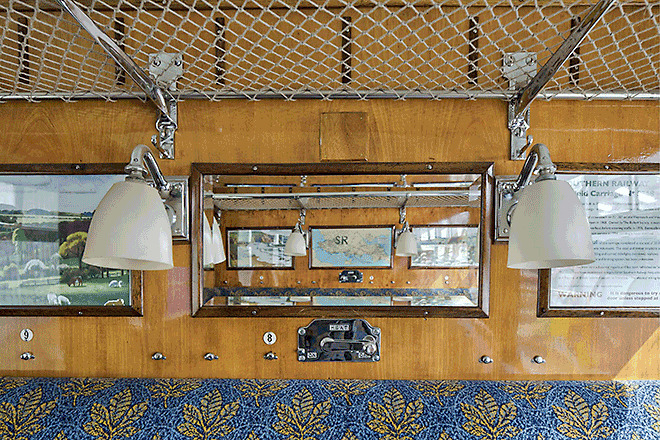 Below are some picture of the completed compartments taken by Mike Anton. The current 500+ club ended in April 2018 and we decided to await the return of the boiler to see our position regarding finances before deciding when to re-start the next club. It is proposed to start the club again to bring it back in line with it’s original timescales. The club will re-start in March 2019 and end in February 2020. 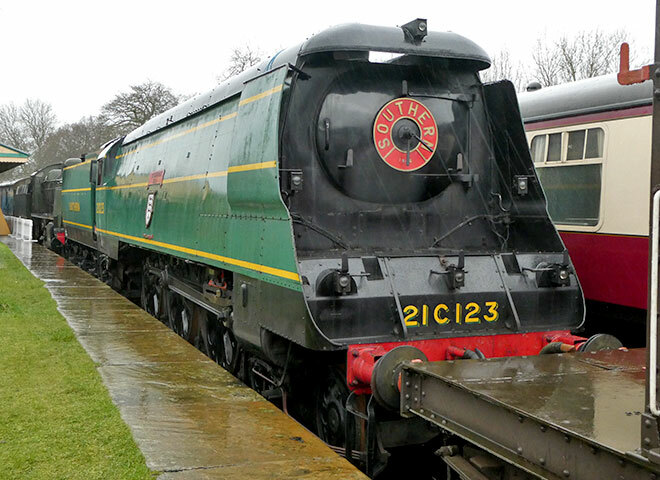 Application forms will be sent out around the Christmas period to everyone who has been a previous member and will also be included in Bulleid Express and Bluebell News magazines and will be available to download from this website. 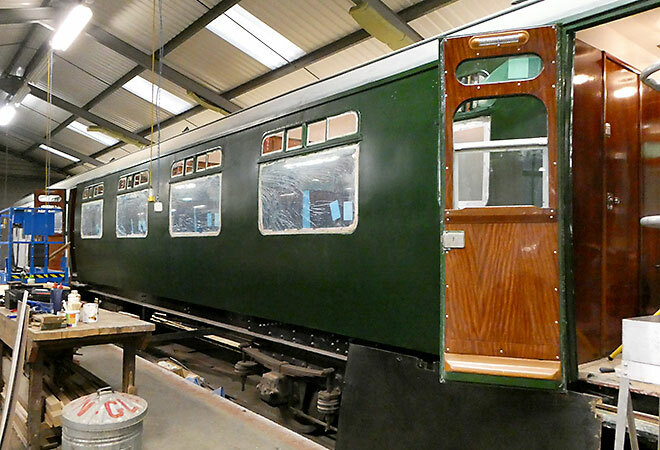 The picture below shows the first of many top coats applied to the western side of No. 5738. 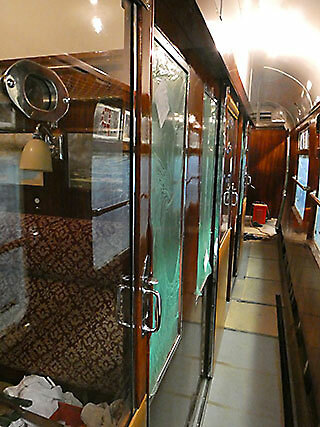 No top coat has, as ye,t been applied to the eastern side of the coach. 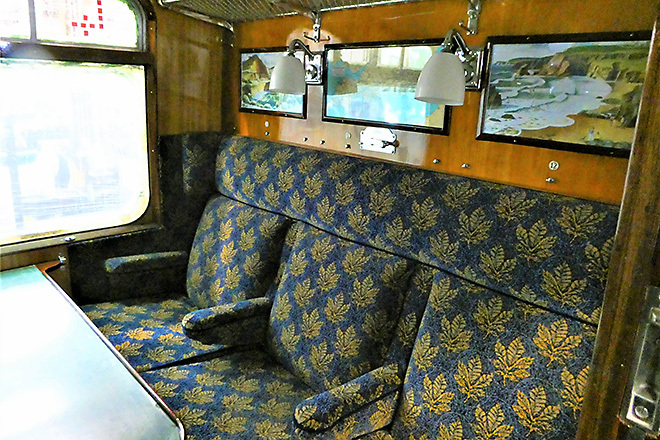 Internally the final batch of reupholstered cushions is awaited and much of the interior is now completed. 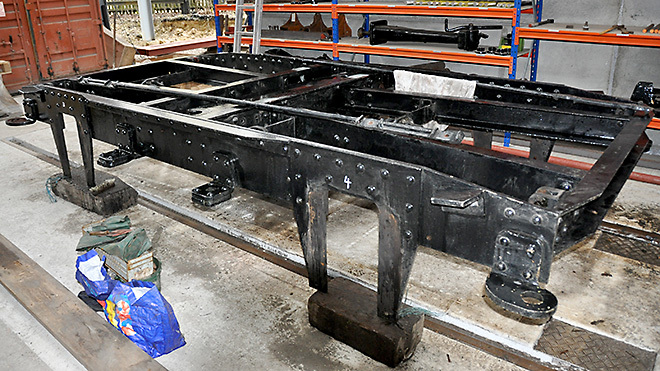 Work on the bogies is progressing with fitted bolts for the horn guides awaited and new brake cross shafts are being machined. 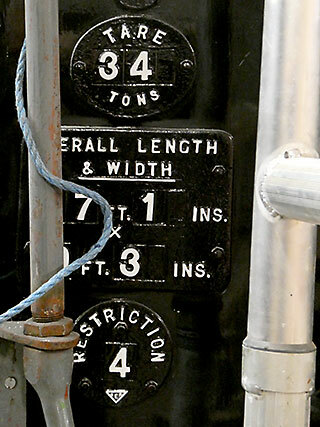 The picture below shows the boiler for No. 34059 arriving back at Sheffield Park on Thursday 9th August. It had originally been sent to to Crewe on 23rd October 2013, however as progress at Crewe was not productive the boiler was moved to SDR(E) in November 2016. 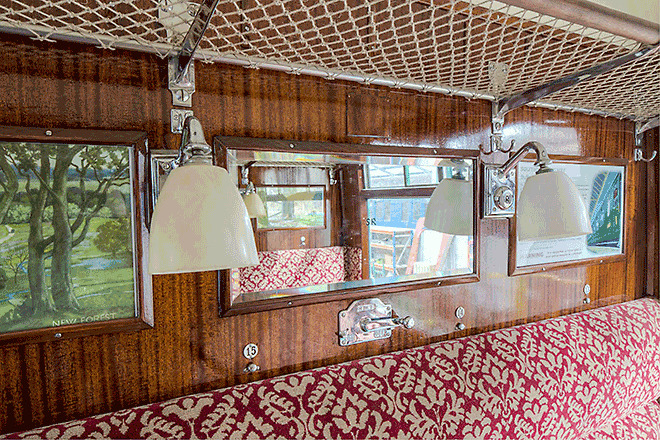 It has now been moved into the workshop at Sheffield Park with the next stage being to review the sizes of stays required – with well over 2000 to be ordered and screwed into the firebox before riveting over on the fireside and caulked on the outside. 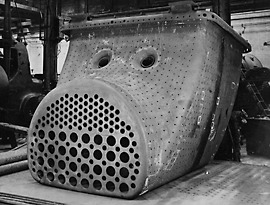 The boiler in Sheffield Park workshop. Left sides of the new firebox. 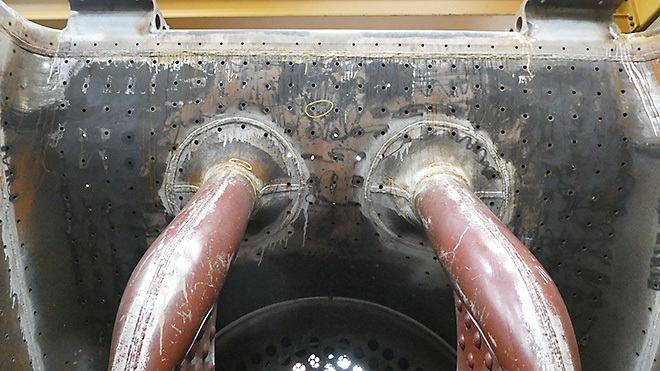 The base of the syphons with the syphon diaphragms in the new pressing of the combined combustion chamber and throat-plate with the firebox tube plate visible behind. After being away for five years, the boiler for No. 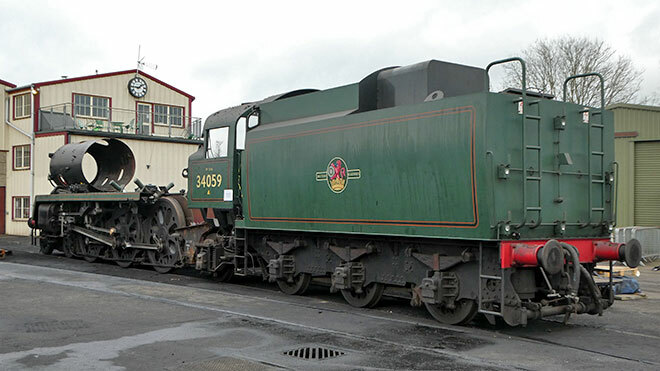 34059 Sir Archibald Sinclair has returned to the Railway. 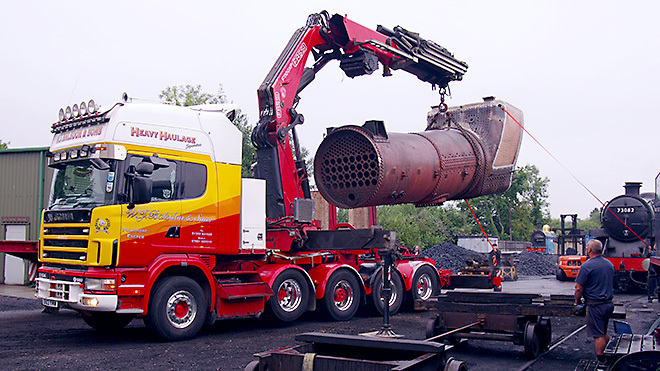 During its time away, it has had new sides to the outer wrapper of the firebox and a completely new inner firebox and foundation channel. 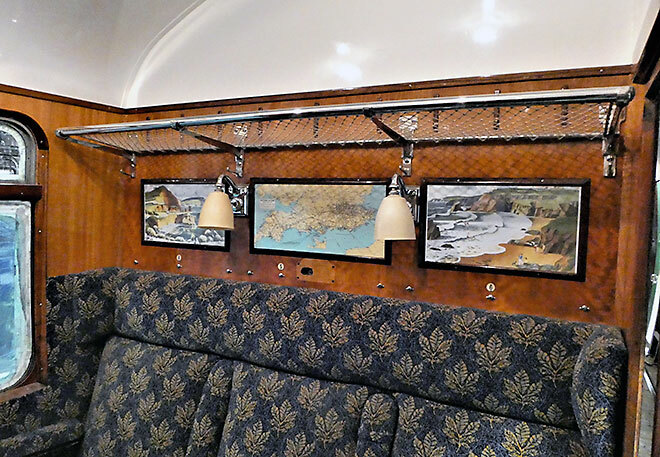 This work has been financed by the 'Keep Up the Pressure Fund', The Bluebell Trust, and the Bluebell Railway Battle of Britain Locomotive Group. It has now been moved into the workshop in readiness for work to commence on re-staying and the fitting of smoke and flue tubes. A return to steam is hoped for within the next one to two years, subject to the usual caveats. 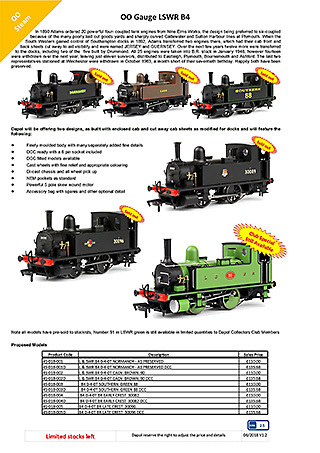 Dapol have released a range of models of the LSWR B4, which includes two versions of No. 30096 Normandy – BR condition and preserved. The livery sheets for all these B4 models were produced by this sites webmaster (Richard Green) in his professional capacity! 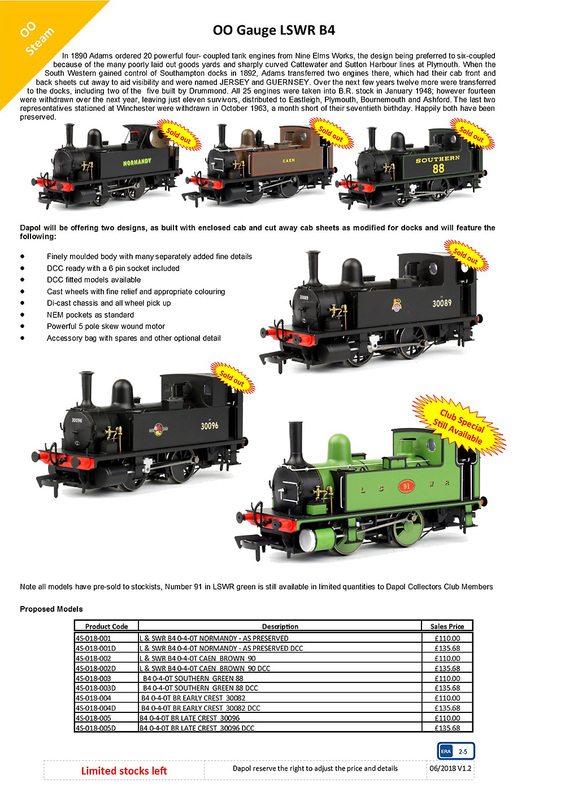 Click the picture on the left to see a larger version of Dapol's press release. Ignore the 'sold out' flash as this just means that these have been pre-sold to stockist not that they are unavailable to buy! Below are some pictures showing the completed first and second class compartments, plus progress with the overhaul of the bogies. 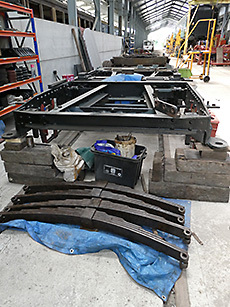 Overhauling the bogies on the tram road. 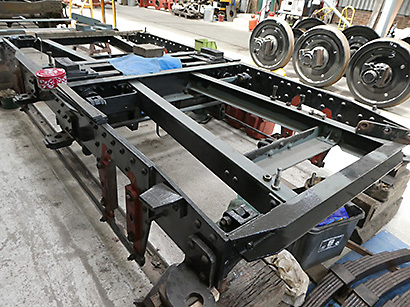 The first of the bogies is undergoing overhaul on the tram road. The new inner firebox for No. 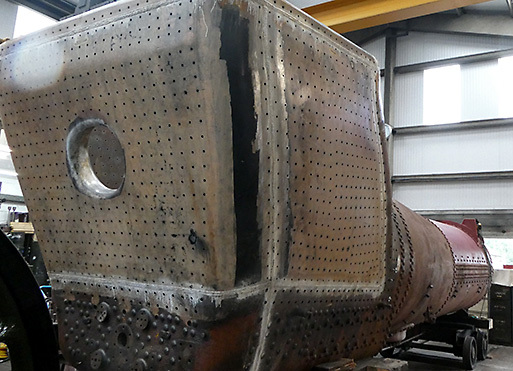 34059 is complete, has been passed by the boiler insurance inspector and has been trial fitted to the outer wrapper of the firebox. 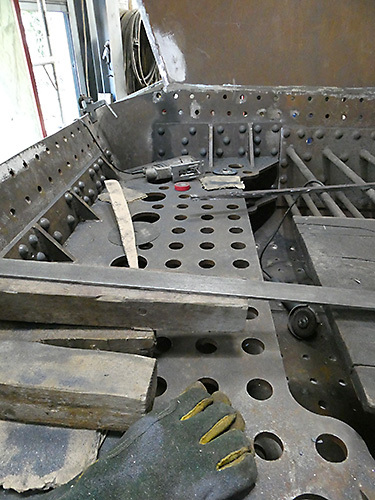 The new gusset plate at the back of the crown plate, which gives support to the rear of the firebox has been riveted in position. The outer wrapper sheets are both being renewed with that on the driver's side awaiting fitting. Marking out and drilling of the stays is underway with approximately 2,200 stays being required. 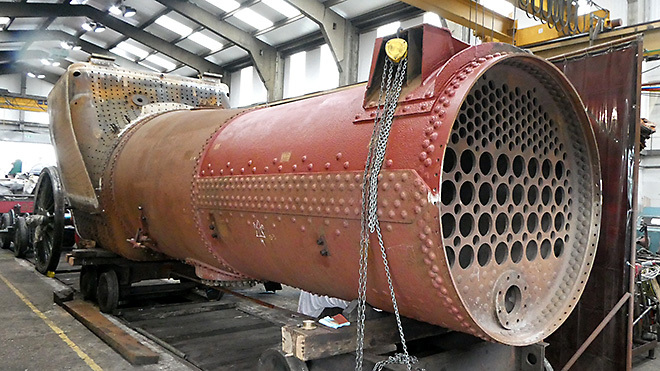 It is hoped that the fitting of the new inner firebox to the outer wrapper and its associated welding, marking out and drilling for the stays will be completed for a return of the boiler to the Bluebell around Easter. The new inner firebox for No. 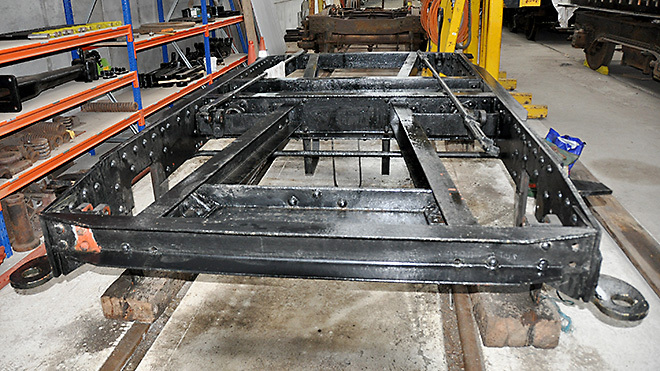 34101 Hartland is nearing completion and components for the new inner firebox for No. 21C123 have now been prepared and await welding. 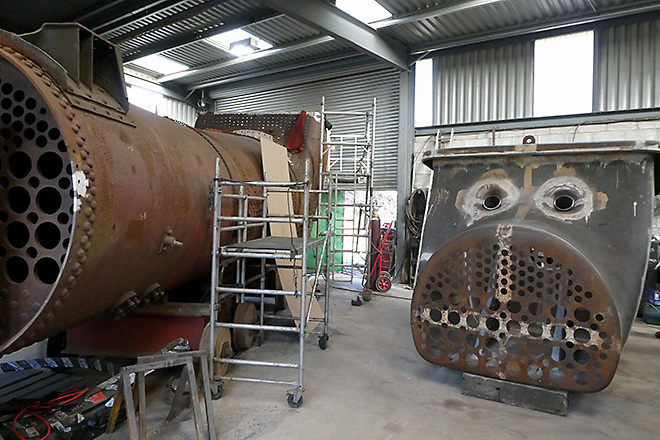 New inner firebox and boiler barrel. View looking forward to the boiler barrel showing transverse stays, new outer wrapper on the left and a corner of the gusset plate visible on the left. 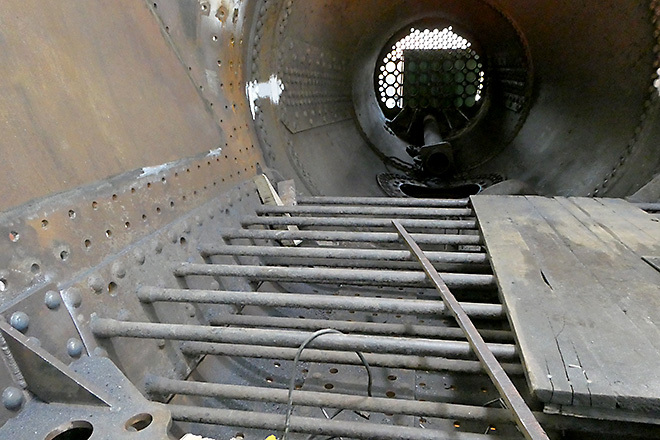 The new gusset plate and transverse stays in the firebox. 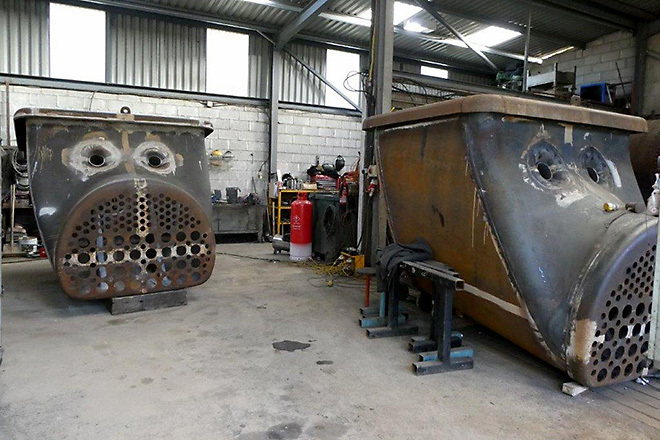 The new inner fireboxes for No. 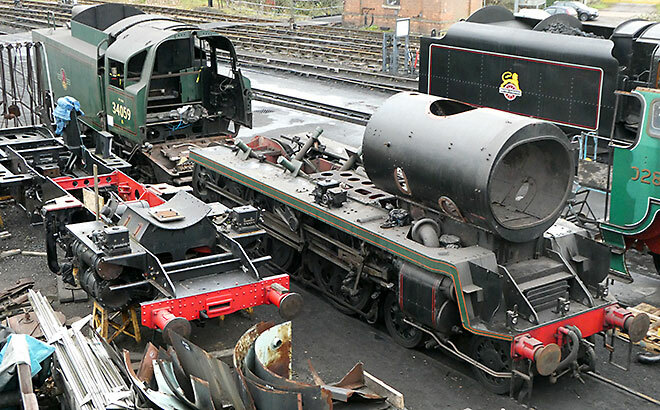 34059 (on the left) and No. 34101, the first two off the production line of what may well be six new inner fireboxes for light pacifics. Also on page 18, LH column, D.A.Look should be D.A.Lock. Apologies for any confusion this has caused. 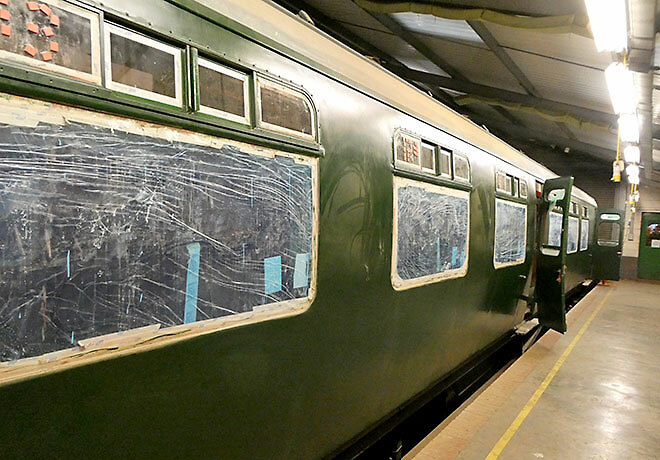 Below are some pictures taken on 31st December 2017 showing progress with coach 5768. 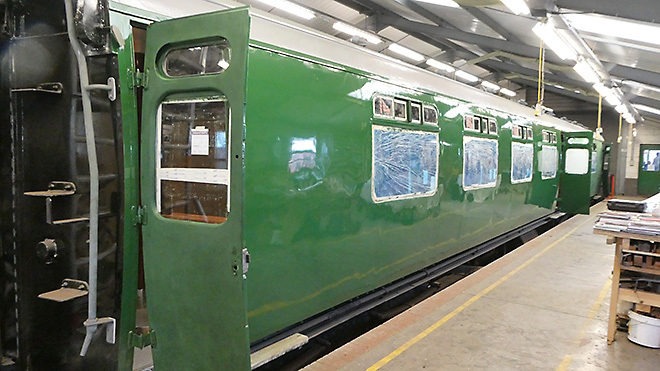 East side of coach in green undercoat. 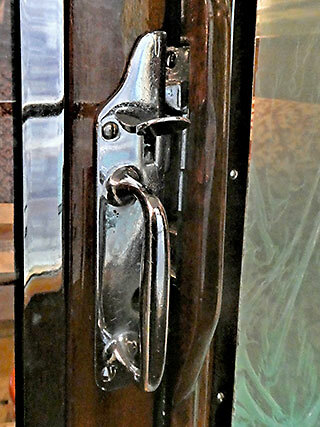 Door to second class compartment showing re-chromed door catch. 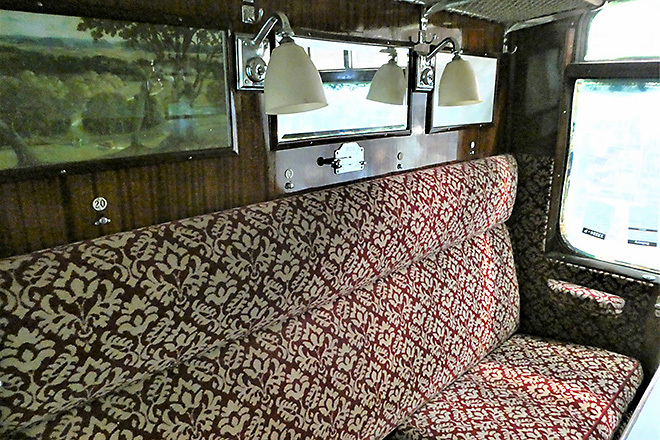 Painted information plates on the end of the coach. No. 21C123 photographed at Horsted Keynes, 31st December 2017, where most of the large engines have been taken while the Accessible Steam Heritage (ASH) project takes place at Sheffield Park. Below are a couple of photographs of No. 34059, minus boiler, outside the works at Sheffield Park taken early in December when the shed was cleared out for the Accessible Steam Heritage (ASH) project.